I looked at Little Miss's empty Easylunchbox container and had little inspiration tonight. I must have a case of the Monday nights. ;) Tired and ready to crash!! Little Miss has a turkey & cream cheese tortilla roll up sandwich. Around it are Veggie Straws, baby carrots, and a beef stick. Top right are (her fave) mandarin oranges. Bottom right has a cup of vanilla yogurt and some blueberries. All packed inside an Easylunchboxes container. Bella had tortilla's too, but not such cute little pinned bundles like yours - nicely done! Corey took the words right out of my mouth! Just when you think you're uninspired, remember that your lunches for little miss are healthier and cuter than 90% of what's out there. Rest up & take care of you, mama! 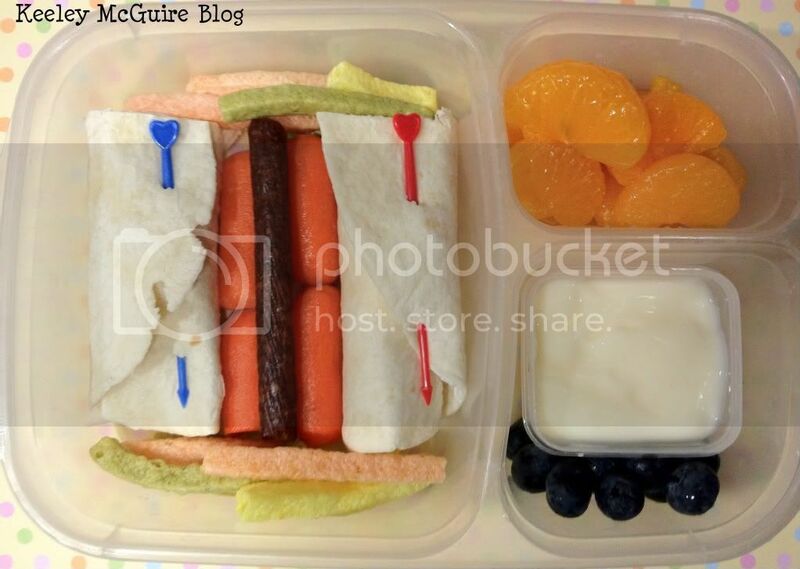 Even with "little inspiration," this lunch is cute, healthy and delicious-looking! !